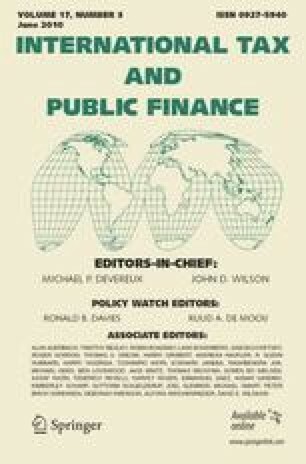 This paper investigates the impact of corporate taxes on the input factor choice of multi-jurisdictional entities (MJEs) under a formula apportionment (FA) regime. Our testing ground is the German local business tax that applies FA regulations with income apportionment according to the relative payroll share. Using unique data on the population of German firms, we find that MJEs distort their employment and payroll costs in favor of low-tax locations. On average, a 1-percentage-point-increase in the tax rate differential between an affiliate and foreign group members is found to lower the affiliate’s payroll to capital ratio by 1.9%. I am indebted to Tobias Böhm, Stephen Bond, Rainald Borck, Thiess Büttner, Michael Devereux, Peter Egger, Clemens Fuest, Andreas Haufler, Bernd Huber, Christian Keuschnigg, Simon Loretz, Ruud de Mooij, Johannes Rincke, Johannes Voget and participants of seminars at the University of Munich, the University of Oxford and of the Congress of the International Institute of Public Finance (IIPF) for helpful comments and suggestions. All errors remain mine.